I'm a big fan of arpeggiators, and wanted to use my ardcore to pull something together. So, I started with thedug's arpeggiator sketch, and whilst it did a fine job, it wasn't giving me what I was after. So, after starting with thedug's version as a baseline, and implementing what I specifically wanted, I eventually ended up with this - FlexArp. I ended up ditching most of the original code, as that was more focussed around preset chord structures (which wasn't what I was after), but it was a great education in how to generate the appropriate outputs. * Selection of scale to be used (13 available). * Selection of the root note of the arpeggio. * Arpeggios based upon the desired distance between steps on the selected scale, and the desired number of steps to take in each arpeggio. * Selection of number of octaves to rise though, playing the arpeggio once in each. * Selection of mode of play - up, down, up/down, root-up, ping-pong and random. * Ability to change which controls relate to which parameters (this is the "Flex" bit), so you can manually, or with CV, change what is controlling what. On the ardcore, this essentially means that you can select what parameters get voltage control, and using this you can get some pretty complex sequences going. You can even use CV to change the control layout on the fly whilst the arpeggios are playing, which basically means that you can change which parameters your CV sources are modulating. Even without any CV, some very pleasing results can be achieved, especially (IMHO) by setting distance & steps levels which cover more than an octave, and having the octaves parameter set above 1, running in Ping-Pong or Up/Down mode. Start to CV the parameters (e.g. distance/steps and octaves with a couple of LFOs), and things can get very complex indeed, whilst still being musical and largely following an (eventually) repeating pattern. ...then I can deal with them in a controlled manner. I've spent the afternoon adding additional functionality - I was trying to manage without a root note setting, but in the end gave in, and conjured up another way of controlling an additional parameter, but hopefully also giving further flexibility over how you manage that control. So, in total you can now control 6 parameters, which is no mean trick on a module with only 4 controls! Seems to be working OK so far, but more testing to go before I'm happy. Looks great! Love to try it out! This looks amazing. Can't wait to get home and try it out. 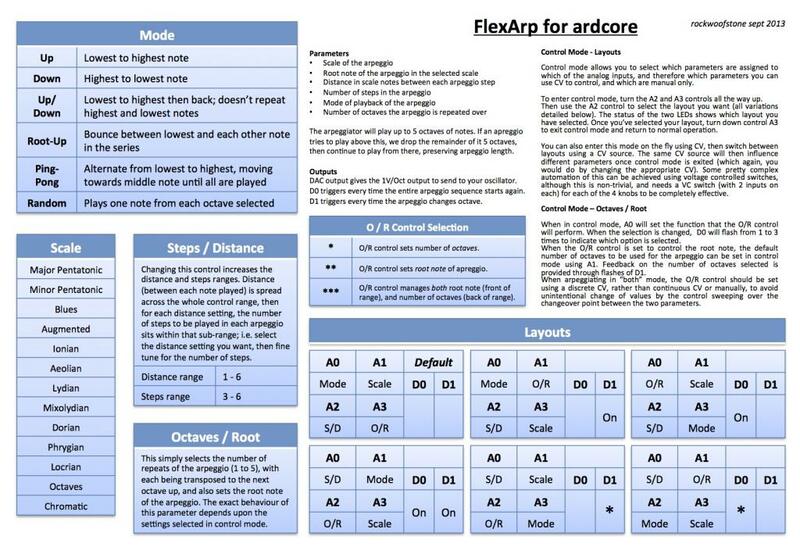 damn i really need to get an ardcore! Just threw together a couple of quick demos. Doesn't show off too much, and barely scratches the surface of the available modulation potential, but gives you an idea of a couple of the things it can do. The first piece is a rather traditional setup, the next three are all variations on a second setup, but use a couple of different modes, and modulate different parameters. Give me a shout if there are any problems, and enjoy! This is great, can't wait to try! Really enjoyed using this today!!! Looks really great ! I will definitely try this ! great arp brilliant modes. Thank You.